Wood roof shakes and shingles cost about twice as much as asphalt shingles. Of all the materials used for roofing surfaces, wood is one of the oldest and most enduring. The first homes in colonial America were made of wood, and even today wood is a very popular roofing choice for some upscale homes where a rustic style is desired. Wood shakes —pieces of wood split into thin, tapered slabs and laid in overlapping layers to provide a waterproof roofing surface—were commonly hand-split for use as roofing materials until the early 19th century, when industrialization and the presence of sawmills made it possible to create sawn wooden shingles. This is the primary distinction between wood shakes and shingles—shakes are formed by splitting, shingles by sawing. Today, both wood shakes and shingles are available as roofing materials, though shingles are more common. 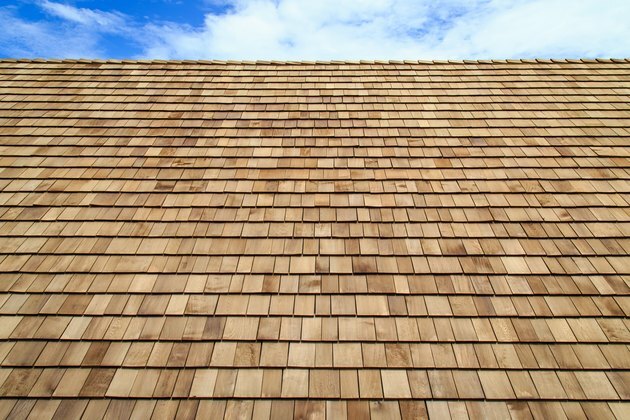 Several different wood species are used for wood shingles and shakes, but in the U.S., western red cedar is the most common material because it's weather-resistant, workable and abundant. Other, less common wood species include California redwood, cypress, and Atlantic white cedar. In Europe, various species of pine and spruce are commonly used. Retailers sell cedar shakes and shingles by the bundle. Each bundle covers about 1/3 of a _square_—which is a roofing term for 100 square feet—and costs, on average, about $130. That put the cost of cedar roofing around $400 per square, or $4 per square foot, for materials only. With installation, you should expect to pay from $600 to $660 per square ($6 to $6.60 per square foot) for a cedar shingle roof. That's more than it costs to install asphalt shingles, but not excessively so, and for the extra money, you get the beauty of natural wood and a roof that will last 30 years or more. However, the roof will need regular maintenance to last that long, and that's one of the disadvantages of cedar—and wood in general. Apart from that, there is little to not like about cedar roofing. Few materials can match cedar for moisture and rot resistance, but if you live in a western state, you might also consider redwood. Redwood has all the wearability of cedar, and may even have an advantage when it comes to appearance. Because redwood grows only near the Pacific coast, however, it isn't as widely available as cedar, and it's more expensive. Yellow pine and cypress are two budget-friendly alternatives, but both types of wood need special treatment to make them suitable for roofing. No treatment can make them as long-lasting and resilient as cedar. Shakes are split on one side, which gives them better weather resistance than shingles. Shakes and shingles aren't the same things. To produce shakes, manufacturers split thin sheets from dried logs or planks, so one side always has a longitudinal pattern that follows the wood grain. Shingles, on the other hand, are sawn on both sides. This makes them more regular and symmetrical, but it leaves cross-grain saw marks on both surfaces. The longitudinal grain pattern on the split side of a shake repels moisture and wears better than the sawn surface of a shingle, which means that shakes can last longer than shingles. Shakes have random thicknesses that create a more cottage-like appearance on your roof, while shingles offer a smoother, more uniform appearance. Shakes are also more expensive than shingles, due to the efficiency of the mass production methods used to make shingles. 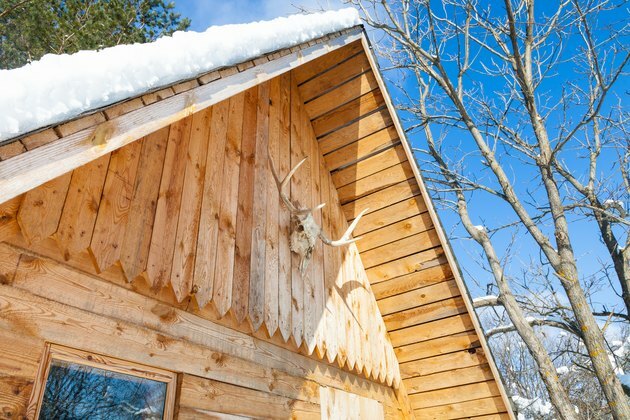 A wood roof adds insulation in the winter to keep your house warmer. Roof insulation: Wood is a poor thermal conductor, so a cedar roof keeps the house warmer in winter and cooler in summer. Wind resistance: Wood shakes and shingles won't lift in windy conditions the way asphalt shingles can. Cedar and redwood, in particular, resist warping, and actually add to the strength of the roof. Dimensional stability: Cedar and redwood shakes and shingles resist swelling and shrinking. They hold fasteners tightly and remain flat as long as sufficient spacing is provided between them during installation. Fire resistance: Commercially available wooden shakes and shingles now come pre-treated with a fire retardant, so they resistant to burning. They should not, however, be regarded as fireproof. 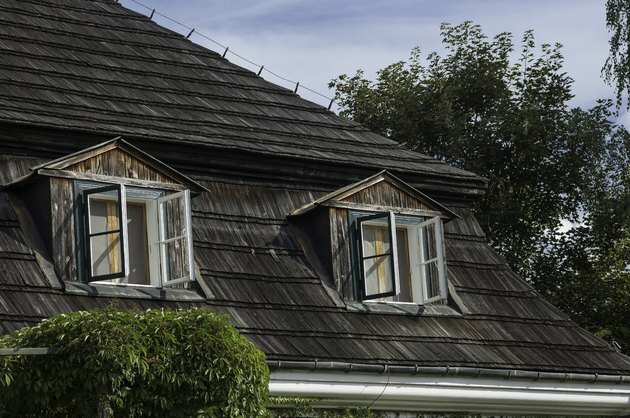 Wood roofs typically require more maintenance than other types of roofing, one of the few drawbacks. Wood shakes and shingles are, in general, more susceptible to moss and algae growth than other types of roofing. 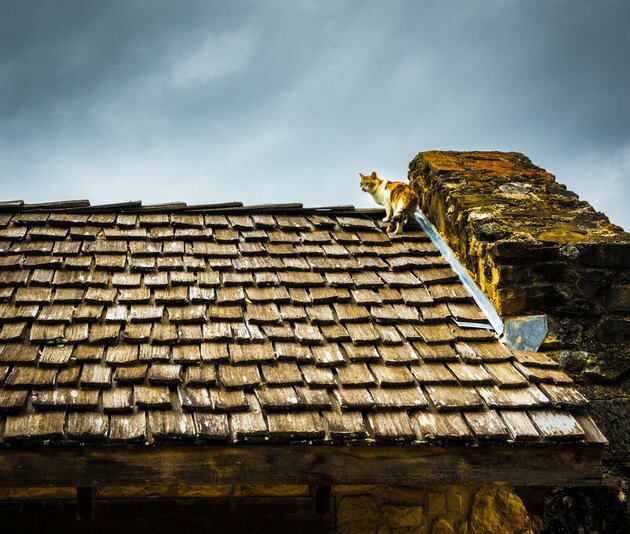 They are often treated with preventive chemicals to resist this, but few treatments are likely to last as long as the roof. When moss does grow, it deteriorates the wood and accumulates debris on the roof, so it has to be periodically removed by power washing or scraping and sweeping. Also, individual shakes frequently split and become displaced or fall off. It's usually easy to replace them. If you live in a dry climate, you can install shakes directly on plywood roof decking. It is recommened to use 3/4-inch decking to provide bite for the fasteners, which are typically 3/4-inch or longer hot galvanized roofing nails. In most climates, installers usually nail spacers on the decking parallel to the roof line and nail the shakes or shingles to the spacers. This provides an air space under the roof covering that allows the wood to breathe, thus preventing warping. Although wood roofing products usually come pre-treated, it's a good idea to provide extra protection with a semi-transparent stain or a penetrating oil. For best results, treat the shakes or shingles before you install them. Avoid film finishes, such as varnish, because they trap moisture in the wood and shorten the life of the roof covering. Wood roofing can last twice as long as asphalt shingles. No matter how thoroughly you treat it, wood is a flammable material, so if you live in a fire-prone region, you should think twice before installing wood shakes and shingles. In most other situations, there's little to stop you from indulging a preference for natural and sustainable building materials by installing a wood roof. You'll pay about twice what you would to install asphalt shingles, but the roof will last as much as twice as long. A wood roof becomes more attractive with age, so you'll save money down the road by not having to redo your roof.